The definitions below are consistent with the instructions given to the" enumerator. As in all surveys, there 'were some failures to execute the instructions exactly. Through the forms distributed to households, the respondents were given explanations of some of the questions more uniformly than would have been given in direct interviews. Nevertheless, it was not feasible to give the full instructions to the respondents, and some erroneous replies have undoubtedly gone undetected. Persons are classified as unemployed if they were 14 years old and over and not "at work" but looking for work. A person is considered as looking for work not only if he actually tried to find work but also if he had made such efforts recently (i.e., within the past 60 days) and was awaiting the results of these efforts. Persons waiting to be called back to a job from which they had been laid off or furloughed are also counted as unemployed. Unemployed persons who have worked at any time in the past are classified as the "experienced unemployed." The "year last worked" pertains to the most recent year in which a person did any work for pay or profit, or worked without pay on a family farm or a family business. Active service in the Armed Forces is also included. Data derived from this item were tabulated for persons classified as not in the Armed Forces and for persons classified as unemployed. The labor reserve is comprised of those persons classified as not in the labor force during the reference week but who have had some work experience within the 10 years preceding 1960. 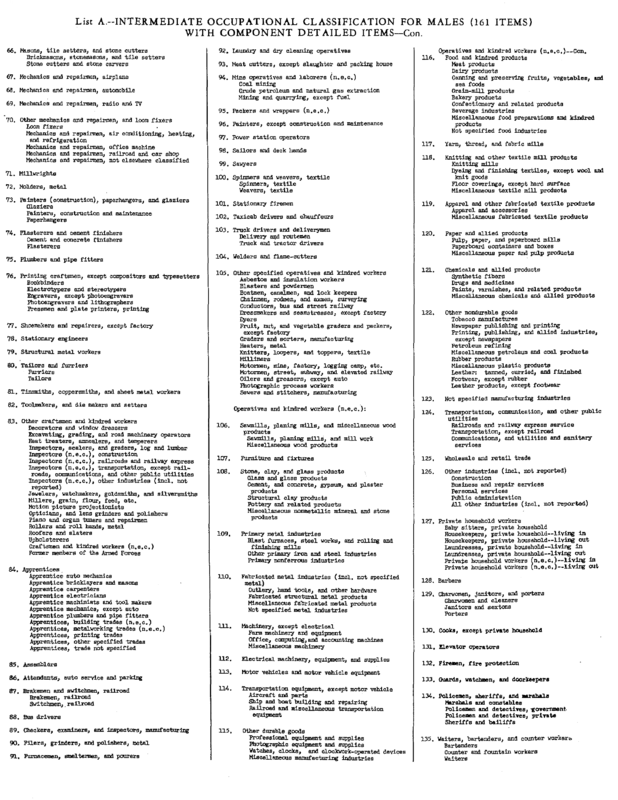 Members of the labor reserve were determined through the following sequence of classifications: First, all persons & years old and over were classified according to the employment status categories as defined above, and second, those persons classified as not in the labor force were further classified according to the year in which they last worked. In the 1960 Census of Population, information on occupation was collected for persons in the experienced civilian labor force and for persons not in the labor force who have worked some time during the period 1950 to April 1960 (i.e., the labor reserve). For an employed person, the information referred to the job he held during the reference period. If he was employed at two or more jobs, the job at which he worked the greatest number of hours during the reference period was reported. For the experienced unemployed and for persons not in the labor force, the occupational information referred to the last job that had been held. For presentation of occupational data in this report, two levels of classification are shown. Sub- groupings of 17 of the 297 specific occupations (mainly on the basis of industry) are made, resulting in the presentation of over 500 items in the detailed listing. Also presented is an intermediate classification system, which presents 161 items for males and 70 items for females. The relationship between the detailed and intermediate levels of classification is given Lists A and B for males and females, respectively. In the separation of "managers, officials, proprietors (n.e.c.)" by class of worker into salaries and self-employed components, the number of unpaid family workers in this occupation is included in the self-employed component. Since the data presented in this report on occupation refer only to civilians, the category "former members of the Armed Forces" for the experienced unemployed and for persons in the labor reserve is limited to those whose last job was as a member of the Armed Forces. The abbreviation "n.e.c." used in the tables means "not elsewhere classified. 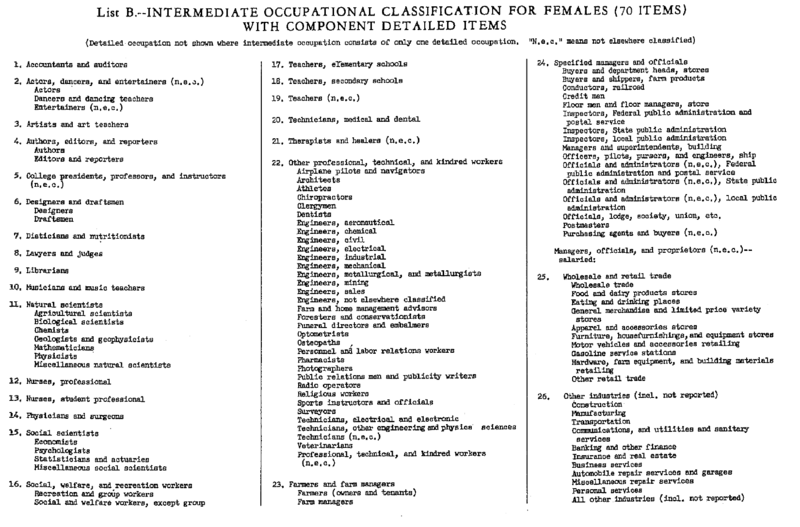 The occupational classification used in the 1960 Census is generally comparable with the system used in the Dictionary of Occupational Titles (DOT).1The two systems, however, are designed to meet different needs and to be used under different circumstances. The DOT system is much more detailed than that of the Bureau of the Census, and it also calls for many types of distinctions which cannot be made from census information. 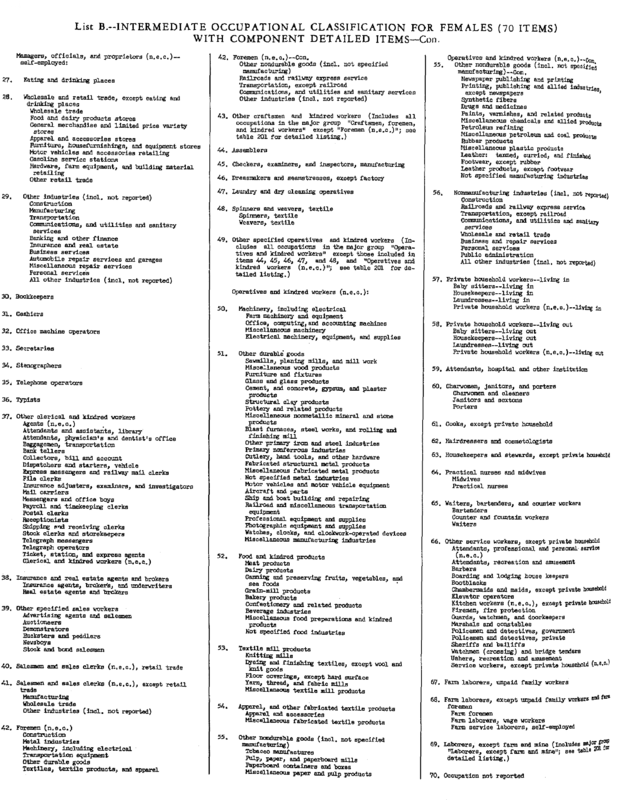 The occupational classification system used in 1940 and 1950 is basically the same as that of 1960. There are a number of differences, however, in title and content for certain items, as well as in the degree of detail shown for the various major groups. 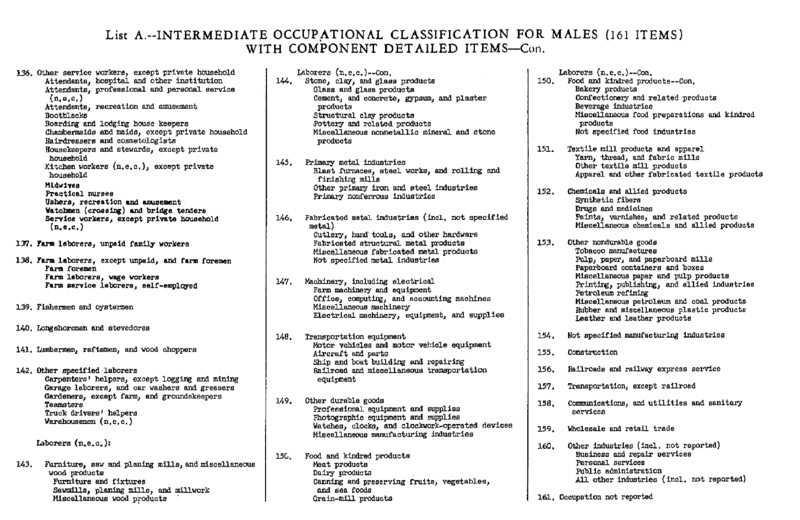 For the Census of 1930 or earlier censuses, the occupational classification system was markedly different from the 1960 system. The following publications contain information on the various factors of comparability and are particularly useful for understanding differences in the occupation information from earlier censuses: U.S. Bureau of the Census, Sixteenth Census Reports, Population, Comparative Occupation Statistics for the United States: 1870 to I940, 1943, and Bureau of the Census Working Paper No. 5, Occupational Trends in the United States: 1900 to 1950, 1958. The median is presented in connection with the data on age, years of school completed and income. It is the value which divides the distribution into two equal parts, one-half the cases falling below this value and one-half the cases exceeding this value. Residence on April 1, 1955, is the usual place of residence five years prior to enumeration. The category "same house as in 1960" includes all persons 5 years old and over who were reported as living in the same house on the date of enumeration in 1960 and five years prior to enumeration. Included in the group are persons who had never moved during the five years as well as those who had moved but by 1960 had returned to their 1955 residence. The category "different house in the U.S." includes persons who, on April 1, 1955, lived in the United States in a different house from the one they occupied on April 1, 1960. This category was subdivided into three groups according to their 1955 residence, viz., "different house, same county," "different county, same State," and "different State." The category "abroad" includes those with residence in a foreign country or an outlying area of the United States in 1955. (In the coding of this item, persons who lived in Alaska or Hawaii in 1955 but in other States in 1960 were classified as living in a different State in 1955.) Persons 5 years old and over who had indicated they had moved into their present residence after April 1, 1955, but, for whom sufficiently complete and consistent information regarding residence on April 1, 1955, was not collected, are included in the group "moved, place of residence in 1955 not reported. In preparing the record for the 5-percent sample, on which, the present report is based, all movers from one borough to another within New York City were classified as movers within the "same county," whereas in reports based on the 25-percent record, persons who moved across borough lines were classified as movers between counties within the "same State." Hence, the 5-percent sample shows more movers within the same county than would be shown in corresponding figures from the 25-percent sample, and fewer migrants between counties within the same State. This difference should have little influence on the percent distributions by personal characteristics within the various mobility status classes. School enrollment is shown for persons 20 to 34 years old in the present report. Persons were included as enrolled in school if they were reported as attending or enrolled in a "regular" school or college at any time between February 1, 1960, and the time of enumeration. Regular schooling is that which may advance a person toward an elementary school certificate or high school diploma, or a college, university, or professional degree. Schooling that was not obtained in a regular school and schooling from a tutor or through correspondence courses were counted only if the credits obtained were regarded as transferable to a school in the regular school system. Schooling which is generally regarded as not regular includes that which is given in nursery schools, in specialized vocational, trade, or business schools; in on-the-job training; and through correspondence courses. 3. A child of the head is a son, daughter, stepchild, or adopted child of the head of the household. ""Child of head" is a more inclusive category than "own child of head" (defined below). 5. A nonrelative of the head is any member of the household who is not related to the household head. This category includes lodgers (roomers and partners, relatives of such persons, and foster children) and resident employees (maids, hired farmhands, etc.). An own child is defined here as a single (never married) son, daughter, stepchild, or adopted child of the person in question. Only those children who are present in the home are included in the number of own children. The data on industry for the labor reserve refer to the last job that had been held. The industry data presented are based on the detailed systems developed for the 1960 Census; see 1960 Census of Population, Classified Index of Occupations and Industries, U.S. Government Printing Office, Washington, D.C., 1960. 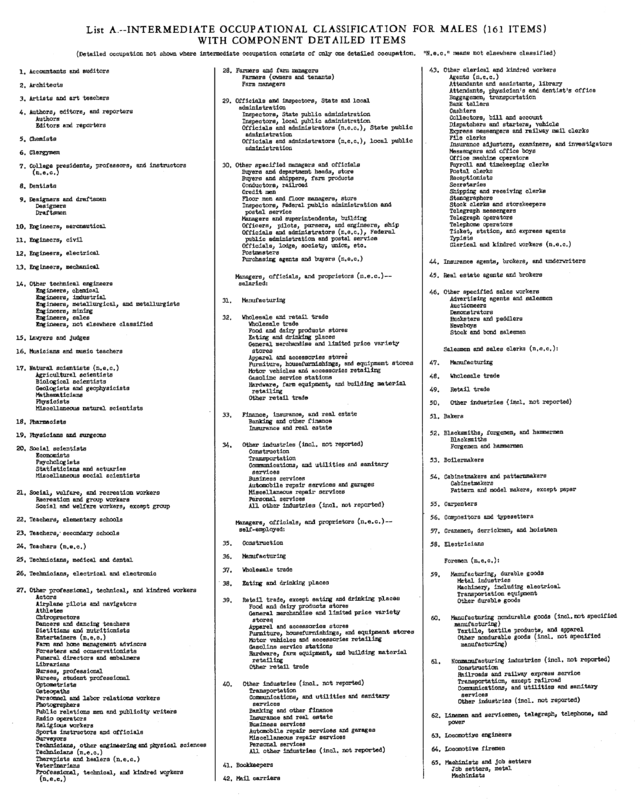 An explanation of the industrial classification system, including its relation to the Standard Industrial Classification (SIC), is given in 1960 Census of Population, Volume I, Characteristics of the Population, Part 1, United States Summary. Persons who worked for profit or fees in their own business, profession, or trade, or who operated a farm either as an owner or tenant. Persons who worked without pay on a farm or in a business operated by a person to whom they are related by blood or marriage. Information on income for the calendar year 1959 was requested from all persons years old and over in the sample. "Total income" is the sum of amounts reported separately for wage or salary income, self- employment income, and other income. Wage or salary income is defined as the total money earnings received for work performed as an employee. It represents the amount received before deductions for personal income taxes, Social Security, bond purchases, union dues, etc. Self-employment income is defined as net money income (gross receipts minus operating expenses) from a business, farm, or professional enterprise in which the person was engaged on his own account. Earnings are the sum of wage or salary income and self-employment income. Income other than earnings includes money income received from such sources as net rents, interest, dividends, Social Security benefits, pensions, veterans' payments, unemployment insurance, and public assistance or other governmental payments, and periodic receipts from insurance policies or annuities. Not included as income are money received from the sale of property (unless the recipient was engaged in the business of selling such property), the value of income "in kind," withdrawals of bank deposits, money borrowed, tax refunds, and gifts and lump-sum inheritances or insurance payments.